Let’s start with the cute. Here’s our crew. Decked out and ready to trick-or-treat on Halloween Evening. 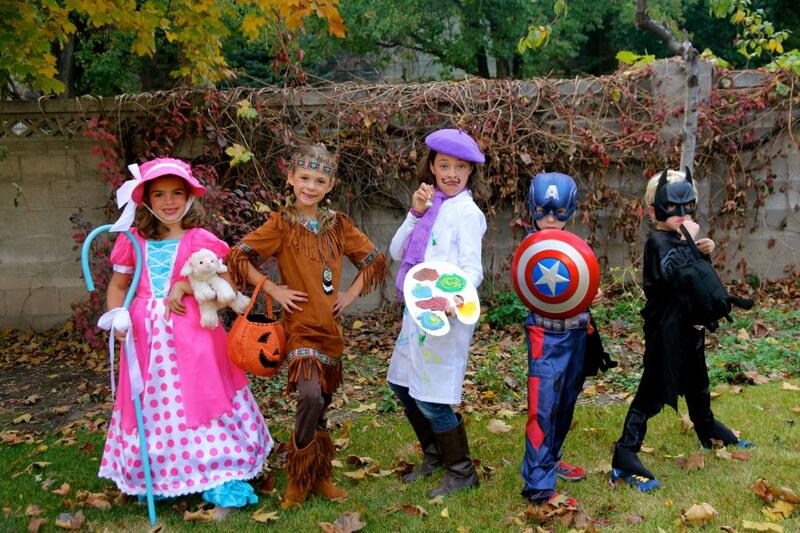 Sami as Little Bo Peep, Ali as Indian Girl, Eliza as a French Painter, Gordon as Captain America, and Spencer as Batman. Here’s the not cute. In fact, it’s flat out unbecoming. This is Friday, Halloween morning, about 3 AM in the ER. After waking with excruciating pain in my stomach and back. Followed by nausea. A repeat from Thursday morning when I experienced similar symptoms after taking the kids to school. I was literally writhing on the floor while Gordon knelt by my head and said, “I’m going to say a prayer for you Mommy.” His prayer worked. Because I lost my breakfast in the toilet and the pain subsided. Weirdest episode ever. But since I felt better, I just went about the normal day. Didn’t even tell Doug about it. Thankfully, the ER was quiet. We got right in and after a significant dose of morphine and tordal, followed by a CT scan to confirm the stone, we left with scripts for percocet and zofran, and instructions to moderate the pain, strain all my urine, and wait 48 hrs for it to pass. Worst timing. I love Halloween. It’s my favorite holiday. The kids had their Halloween parade that morning, I was supposed to help with class parties. I had 25 mason jars in the car, plus supplies, all ready to go for a class craft. And now? I was going to lie in bed miserable, trying to get a handle on the incredible pain this miniscule stone was causing me. So Barb is the newest member of our family. I suffered through Halloween, and finally, after doubling my dose of percocet, was able to step outside and take a few pictures. Eliza was dying to strike this javelin pose with her paintbrush. She put her costume together herself. I thought she did a great job. Beautiful Ali. She wrote me this letter at school on Friday. She was especially disappointed that I couldn’t be there to help with her class party so this note meant a lot to me. Sami loved carrying her lamby around with her. This was the perfect costume for her. Doug couldn’t look at Captain A without chuckling. I think it was the mask. He though it looked like Gordon was wearing underwear on his head. I thought it was endearing. How much he loved his costume. Especially when he made his tough face. The kids were first to start popping Miss Marion’s bubble-wrapped stairs. Best place to begin their rounds. We love Marion. She’s the kind of backyard neighbor everyone needs. Our other favorite neighbors? The Greenwoods? Getting their scary on. And I’ve got to jump back to Deb and Will’s famous Halloween shindig. This year Doug and I went as… can you guess it? Doug has had a surprising amount of comments over the last few years that he looks like Barack. Can you see it? Maybe in the hair? Well, we thought we’d run with that and give it a go. My wig looked more Elvis than First Lady, and the bronzer we used on our skin didn’t quite cut it. (You just can’t fake skin color.) But we did our best. And funny enough, we won best couples costume. I especially love Deb’s presidential photobomb. Here’s the amazing piñata Will and his buddy Silas made. The Stay Puft Marshmallow Man. Every year they amaze us. And it seems such a shame when we hack it to pieces with a bat. Hana is a darling. She has an unusually calm spirit. Joy wherever she goes. Bec and Neil pulled off the 90s look. That’s our era, sis! My cousin Liz, who almost always wins best costume, came as Marilyn Monroe. Pretty incredible wig. She had every detail just right. And another favorite costume. Edgar Allan Poe and the Raven. Very clever. Last but not least, our German host and hostess. Deb and Will always throw the best party. So grateful to them. Halloween definitely had its great moments. And… it’s not so great. A kidney stone was quite the trick. I hadn’t planned on being treated with pain meds. Would have preferred milky ways and kit kats. But so it went. Tricked and Treated. And I am SOOOO glad it’s over. I have a whole new, magnified empathy for anyone who has passed a kidney stone before. No small victory. Hope your tricks and treats were sweet ones. Tell Eliza that I think her costume is the best of the bunch. So adorable! And I am very glad that you are feeling terrible. Barb is my least favorite Arvy! Make that BETTER, very glad that you are feeling BETTER. Oops, where is my mind? Oh yeah, my 4 kids have stolen it! Mom brain. Sadly, I find it rather consistent, even though we're out of the baby stage. Laughed at your typo. Just a subconscious retelling of how it was. Terrible! And I'll tell Eliza. That will make her smile. Love you Michelle. Reading this makes me squirm with sympathy pain. SO glad you're feeling better! Looks like the kids had a happy halloween in spite of your misery. Catherine! I am truly so sorry that you had to deal with the pain of a kidney stone– especially for your favorite Holiday. I am glad that you are doing well now and that your kids had such a wonderful Halloween aside from the fact! Also I just wanted to let you know that you are such an inspiration to me. I have been reading back on your posts when your twins were younger (toddler age) and I love your honesty and the way that you make hard things beautiful. I truly look up to you and I am so grateful for your beautiful writing! Darn it! I saw Doug and your cute kids at the parade and thought to ask Doug where you were. I was distracted by a class of kids coming by and didn't ask. I wish I would have so I could have helped you guys out! Your kids looked adorable. I especially loved Eliza's. Very creative. Glad things are back on track. Dear Catherine, I am SO sorry to hear about how much pain you were in during all the Halloween fun! Wow! It sounds absolutely miserable. I adore your sense of humor. Naming the stone Barb is just perfect. I wish I lived close enough to have been of some help during that terrible time! Those costumes all look incredible. Your kids are so adorable! I love the Obama couple costume. One of the best pairs I have ever seen for Halloween. Lisa! Doug said he saw you at the school. I'm SO excited you have your daughter there! It will be so fun to connect there now and then. It's a wonderful place. I'm so happy we're there. How are you liking it? Anne Marie – Oh dear lady. We've had quite the run. Stomach flu just a few days past the kidney stone. Then no heat for two days. When it rains… right? Still remembering with great gratitude our time together this summer. And meeting your darling boys. And your husband. What a wonderful family you've created. You remain a real light to me. Sending so much love this November. Melinda – Definitely something I can laugh about now. But in the throes of no pain meds and hobbling into the ER, I swore I would never laugh again. At anyone. In any kind of pain. Ever. 🙂 Hoping you are well dear friend.